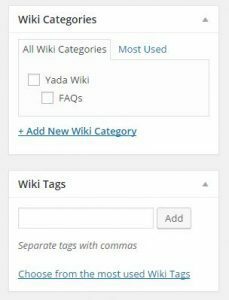 The Yada Wiki custom post type uses standard WordPress Categories and Tags. On the wiki edit screen, you can check the categories or tags that you want to be assigned to the wiki page. There are standard WordPress admin pages for managing the categories and tags as well. 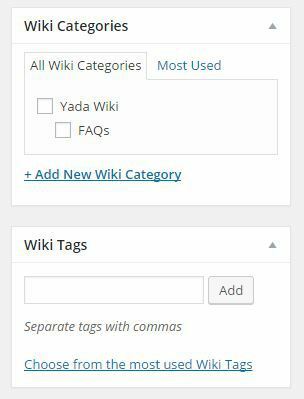 There are a number of WordPress plugins that allow you to display categories and tags and if they support custom post types then you can use them with the Yada Wiki plugin. Many themes also have pages for displaying posts by category.